I have lots in store to come this month when it comes to my closet! I've been revisiting a book that helped me get rid of things I no longer loved last year. I am in need of re-examining what I now would like to keep. I'm spring cleaning my apartment, car, purse, life, and wardrobe! One of the things this "freedom of stuff" has given me is the joy of minimizing what I have so that I only keep what I love-what excites me! I am putting together a few Spring Capsule Wardrobes currently to see what I'd like to keep and how to mix and match. Once you figure out the right formula the possibilities of outfits are endless! I've been inspired by Pantone's colors of the year, Serenity and Rose Quartz. I thought I'd used some of those delightful pastels with my old faithfuls (black and white stripes) and my current color crush-olive-to create my 2016 Spring Capsule Wardrobe. 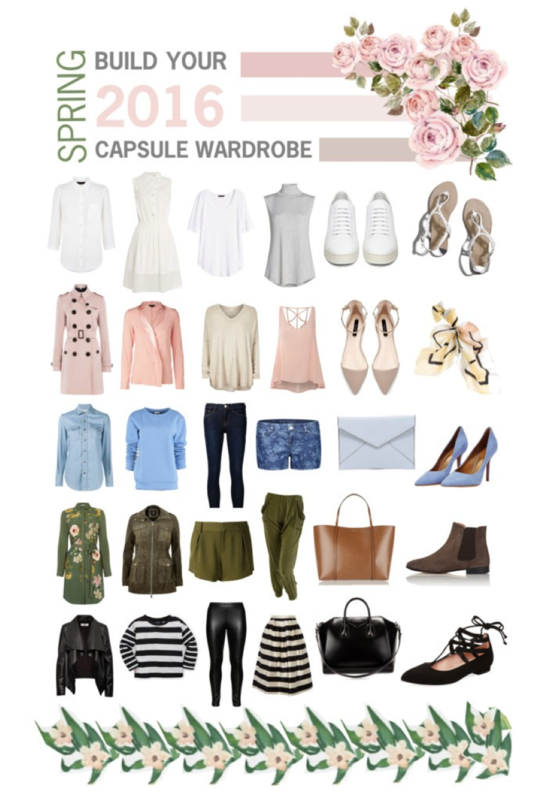 What is your favorite kind of capsule wardrobe? Is it something you rely on throughout the year or mostly when you travel? I do a mix of both-it's nice to have it throughout the year but it's a necessity when I travel! Do you already have some items like these and could see yourself adding to it to make your own capsule wardrobe? If so, how? Please share!